Whether you are 12 weeks pregnant, an active single 20-something, recovering from a joint injury, chronically depressed or sleep deprived, living in an aging brain and body, or a tired parent who has not put your health first for years….Kundalini yoga practice presents a lot of opportunity for healing and growth. 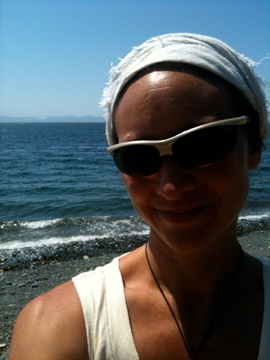 I should know…I just carved 24 hours away from family, home, child and all responsibility to delve deep into Self at a Kundalini Yoga Retreat near Sooke, BC. All I need to say about this experience is Wahe Guru!! (Indescribable is the Ecstacy of the Wisdom of Awakening to Our True Nature!) I feel renewed, awake, and peacefully energized to sustain my practice and deepening of awareness, centering and growth. I effectively re-calibrated my system to a higher frequency and eliminated the negative effects of chronic stress (and my interpretation of stress ongoingly). Stress lowers immunity. We live in stressful ways, stressful culture, during stressful planetary and Universal times. Yogic philosophy aligns with traditional healing systems such as Ayurvedic medicine, Traditional Chinese medicine, and even modern western medicine when it emphasizes that stress lowers immunity, which leads to compromised body function and dis-ease – including many leading causes of disability and death in the 21st century. Immunity is not simply a herd of white blood cells ready (or not) to attack invaders; it is a complex psychological, energetic, integrated system that includes nervous cellular signals, hormones, tissue receptors, and even can be affected by cognitive/mental states (placebo effect). Since Immunity is a process so intricately linked to wellbeing of mind, body and spirit, it is impacted by yoga, which works on multiple layers of the body & facets of the mind. Yogic kriyas and meditations are specific tools – applied to pinpoint certain neurotransmitters, glands, organs, cells and “consciousness” space between – for the purpose of bringing about change in the body-mind-spirit continuum. Kundalini yoga practice has samadhi (experiencing pure consciousness) through “calming the waves of the mind” or Yoga Chitta Vritti Naroda as a central goal/outcome. It means going beyond the thinking mind to a more integrated experience of Awareness. Hence, quieting/eliminating thinking in the analytical part of our brains can enhance whole brain function, especially hormonal balance and through that…. enhanced immunity! Just like a home yoga practice does, community yoga classes like what I’m offering in the way of Thursday All Levels Kundalini Yoga, Family Yoga, Prenatal Yoga and Parent-Child Yoga classes all aim to positively influence personal goals, including increased immune system strength and brain integrity. I’ve included a delicious brain-balancing homegrown recipe here for ShanaKopita (my version of spanakopita) that includes chlorophyll- and vitamin-packed greens and herbs grown in my garden, as well as eggs from neighbourhood ducks, which contain important, non-acidifying proteins and B vitamins for brain and immune system health. Here is an article about hormones and Kundalini Yoga, including medicinal herbs and foods in the Ayurvedic tradition (Karta Purkh Singh Khalsa, DN-C RH). This coming Thursday’s class is focussed on supercharging our immunity and will involve a prescribed fruity drink in the kriya (which I’ll bring for all). I invite you to experience the transformation!